This week, as part of my Along the Way Interview Series, I’m talking to Bridget Overson. 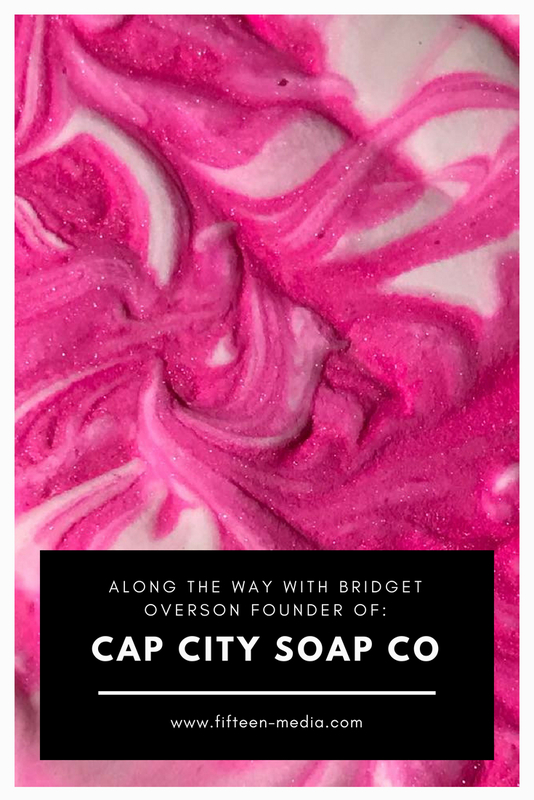 As the founder of Cap City Soap Co, she is using her background in graphic design, an MBA, and a passion for luxury artisan soaps to make products people love to talk about. She’s sharing with us what it took and what it takes to enter the ups and downs of entrepreneurship. Without further ado, let’s chat with Bridget about how she pursues her vision. Tell us about how you started Cap City Soap Co.? At the beginning of 2017, I found myself without a job, through no fault of my own—my position at my job had been eliminated due to financial cutbacks. On a trip, I wandered into a Lush store and picked up a gift (a $10 slice of soap) for the friend who was watching my dog, and I chose one for myself as well. I loved the soap, and in looking at it, I thought "Hey, I wonder if I can do this." So, I began to research soap making and found that it was a topic that appealed to my senses in many ways including my interest in chemistry as well as my current training as a graphic designer and artist. The more I learned, the more I wanted to give it a try. So, I went out to the local shops and picked up a few ingredients and gave it a shot. The thing about soap is that there are so many different things: combinations of oils and fats, colors, and scents, design techniques, etc. that there is literally no limit to the creativity you can bring to the craft. So, I made more and more. After perfecting my technique and testing my results on some of my friends and family, I decided that this was something I wanted to commit to. I was lucky because my background in graphic design and marketing made defining my brand and target market easy, and before I knew it, I was in business. What has been your biggest challenge as a new business? I think for me the biggest challenge has been the financial aspect as well as planning. Being only in my first year of business, it is hard to project how much product you will sell at any given event. Figuring out how much to make, how to stay ahead of demand, and how to pay for the raw materials I needed was a major challenge for me, and one I have not quite perfected yet. I am finally in a place where the business pays for itself, but I still have a bit of my initial investment to pay back to myself. I am hoping to become profitable by the end of this year. Fall craft fair season is rapidly approaching! What is an obstacle that has surprised you the most about starting a business? The biggest obstacle for me so far has been making time to take care of my business among all the other priorities I am facing currently. Aside from Cap City Soap Co. I am also a freelance graphic designer and pursuing my MBA. Add in time for exercise and self-care, as well as time to be social with my friends, and my days tend to be very full. What has been the biggest reward of starting your business? The biggest reward comes when complete strangers seek you out wherever you are, at the local Farmers' Market, for instance, just to let you know how much they love a product they bought from you. When people take a chance on you, and they derive a benefit from that so much that they just have to let you know, that is an awesome feeling. It's great knowing that something you created with your heart and soul has done some small thing to make another person's life just a little bit better. Go for it! But first, make sure you do your research and that you have a business plan. In working through my MBA program, I have had a chance to learn and define so much about who I am as a business owner, my company's identity, and financial analysis of performance. You need to know what you need to get started in terms of LLC, insurance, startup costs, and legal requirements. Help with these things is often available at low to no cost. Take advantage of these services if and when they are available to you. I deal with self-doubt nearly every single day. Don't we all? When I am feeling like I need a boost, it helps to talk to my "cheerleading squad." I am lucky to have a group of people surrounding me who are always there to encourage me and remind me that what I am doing is worthwhile. Life is my biggest distraction. Because my days are 100% dictated by me, they tend to change with the wind. Sometimes I have a client request that needs to be done NOW, and when that happens, I have to drop what I am doing to service them. When your day is managed by nobody but yourself, it can be difficult at times to prioritize what needs to be done now, what can be done later, and what doesn't need doing at all. I just try to see which activity will have the most impact on myself, my clients, and my bottom line of course, and fill in with the other stuff when I am less busy (like composing and sending this email!). I try to get my work done during business hours and do my best to turn it off during the nights and weekends. I make time to exercise and do social activities such as my ballroom dance lessons, and I work on personal projects whenever I have the time. I also enjoy a solo trip to the beach where my biggest goals are to read and maybe take a walk along the shore. I wouldn't call it a mistake, but I have attended events where the sales were not worth the entry fee. Rather than a mistake, I call them learning opportunities. Being my first year in business, sometimes your marketing efforts feel like throwing spaghetti at the wall to see what sticks. The best you can do is learn from those experiences so that you can do better in the future. It is all part of the process. I am fairly happy right now. I am working on my business while my dogs snore at my feet. Owning your own business is hard, especially when you are responsible for everything from the sourcing of materials through manufacturing and bringing your product to market. When you need to wear all the hats, it can be difficult to remember your number one goal: making quality products that improve people's lives. If you can keep your eyes on that, however, it all becomes worth it.